For those craving a more savory option, or who may have over-indulged the night before, this healthy Bloody Mary is sure to satisfy. 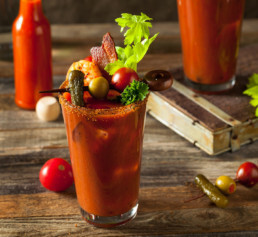 If your “hair of the dog” Sunday brunch go-to is the Bloody Mary, why don’t you try the alcohol-free (and waaay healthier) version? This is your chance to get creative and go beyond the requisite celery and lemon wedge! Pickled anything is amazing—try green beans, asparagus, carrots, okra, and baby onions. You can also add protein—turkey bacon or shrimp are interesting options. Run the lime or lemon wedge around the rim of the class, and then turn upside down into a small plate with the salt and pepper. Carefully combine the remaining ingredients in the glass, add a couple of ice cubes, a sprinkle of pepper, and your garnish!